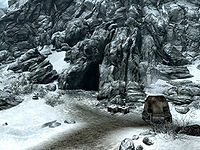 Whistling Mine is a small iron mine located southeast of Winterhold. It is situated along the southern path that leads out of Winterhold towards Windhelm, at the base of the mountains. There is a smelter just outside and to the right of the entrance, with three pieces of owned iron ore on a crate beside it. A Winterhold guard patrols along the road in front of the mine and there is an animal encounter just north on the road. A path rising to the west starts just south of the mine and leads to Mount Anthor and the Shrine of Azura. It is one of the smallest mines in Skyrim, only containing two iron ore veins. Upon entering the mine, the first chamber serves as the camp for the four miners who work here—Thorgar (the mine's owner), Angvid, Badnir and Gunding. All of them originally began digging the mine because they seemed to think it would make them rich, but all have lost their morale except for Thorgar and Gunding, who still believe that the mine will hit silver or gold ore. Thorgar will buy iron ore. There is a campfire with a cooking pot on a stand beside it in the center of the room. There are four bed rolls to the east of the campfire and a table holding a pickaxe, and chairs to the north. To the west of the table are a couple of barrels of food, one of which has a copy of the Smithing skill book Heavy Armor Forging. There are several other food sacks and barrels around the room. To the west is an ice tunnel that leads to a second chamber where there is a wooden ramp up to the ore veins on the north wall. Esta página foi modificada pela última vez à(s) 00h37min de 8 de novembro de 2014.